Hello from Italy! Brian and I are on a much-needed vacation in the land of pizza, pasta, and wine right now. It’s also the land of cake (and other pastries) for breakfast, and I am 100% ok with that. 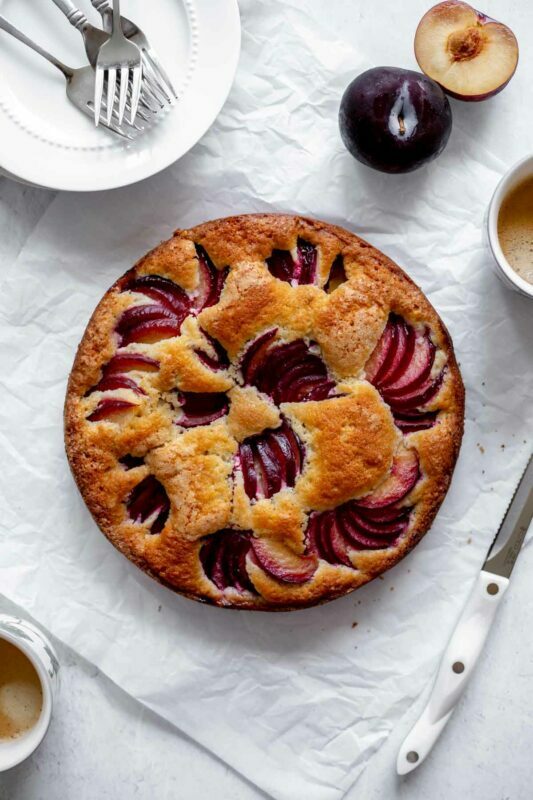 So much so, in fact, that I created this plum coffee cake in anticipation of the culinary joys to come. This is actually our third trip to Italy together. We’ve gone every other year since 2013! First it was the standard Rome/Venice combination in the summer of 2013, then Milan/Lake Como for our honeymoon in summer 2015, and now Puglia (the heel of the “boot” of Italy) for fall 2017. We’re getting more adventurous in our choice of locale with every trip! I wish I could say our Italian was improving, but sadly we are still received with English responses whenever we try. One of these days, we’ll be able to fool them. Puglia is certainly a unique part of Italy. It feels nothing like Rome, and nothing like northern Italy at all. It’s mostly composed of wide open countryside with winding roads, olive groves and vineyards, fig trees everywhere you look, and white stone cities rising from the shores of the sea. This is a place where people have lived off of the land for centuries, and it shows. The fresh produce is amazing! In fact, the menus we’ve seen so far have been quite vegetable-heavy, rather than the meat-heavy, heartier fare you find in the north. The pasta specialty here is orecchiette, or “little ear” pasta, with broccoli rabe and olive oil. I feel like that makes up for the amount of cake (torta) and gelato I’ve already consumed. And that’s a lot to make up for. This morning, for example, our hotel (the Masseria Cervarolo; I highly recommend!) 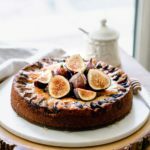 laid out a selection of at least six different cake varieties for breakfast, in addition to a host of fresh fruits from their on-site fruit trees, meats, cheeses, yogurt, and bread and jams. And they made one of the best cappuccinos I’ve had. I tried 2 different cakes this morning, apple and banana/plum, and both were excellent. The apple, in particular, was spectacular. A soft crumb with slices of apples nestled into the batter, and a crumbly crunchy sugar top. Heaven, for sure. I am definitely going to attempt to recreate that beauty when I get home. 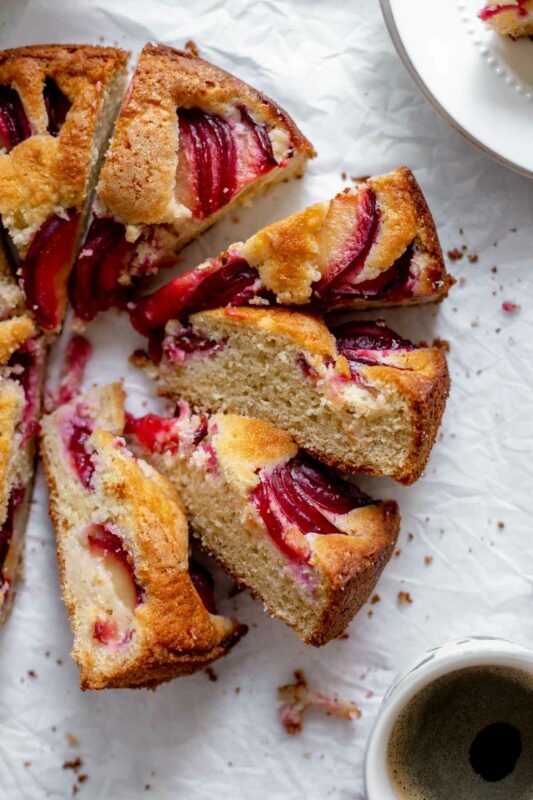 For now, though, this plum coffee cake is actually quite similar. 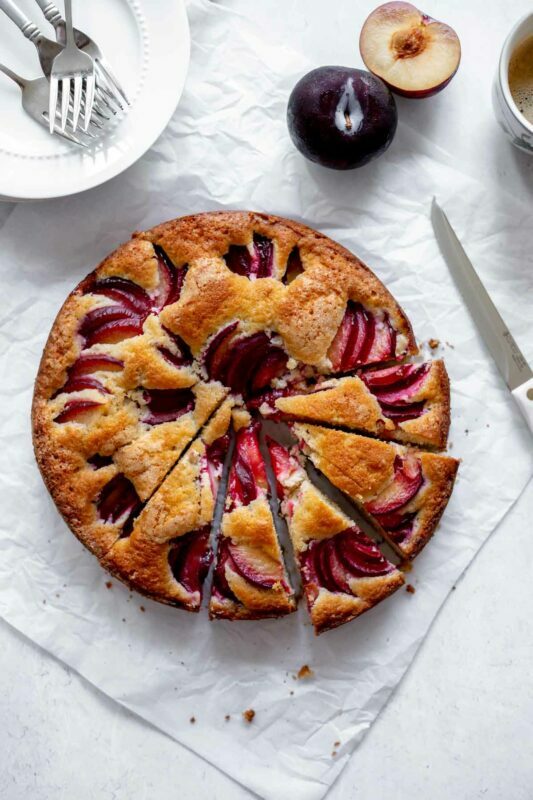 I had a load of golden plums from a trip to Michigan a few weeks ago, and decided to make a coffee crumb interpretation of this classic plum torte from Marian Burros to put them to good use. 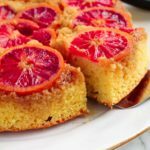 If you’ve never made that torte, please go do so immediately. 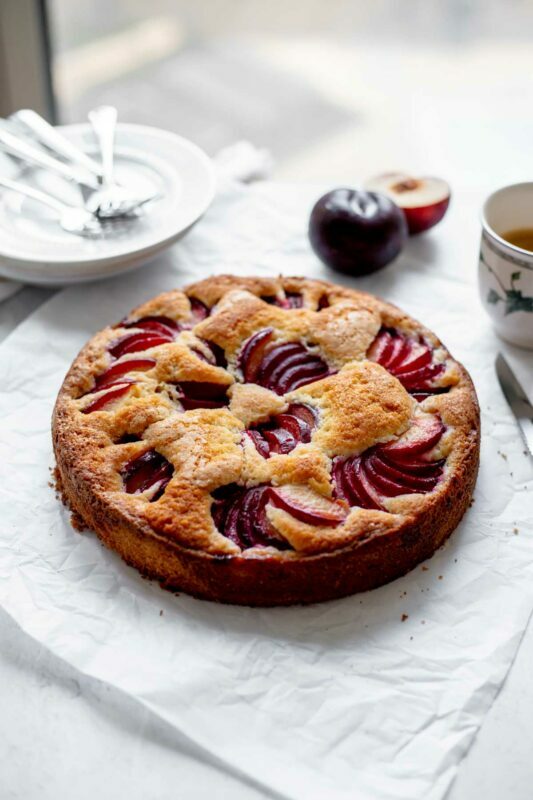 There’s something about the sunken plums and the cinnamon-spiced batter that is pure heaven. Plus, it’s the ultimate early fall cake in my mind. 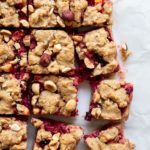 This is a little different from that, as the batter is a little richer and sturdier, and the crumb topping is a bit crunchy and sweet, but it’s the same principle. 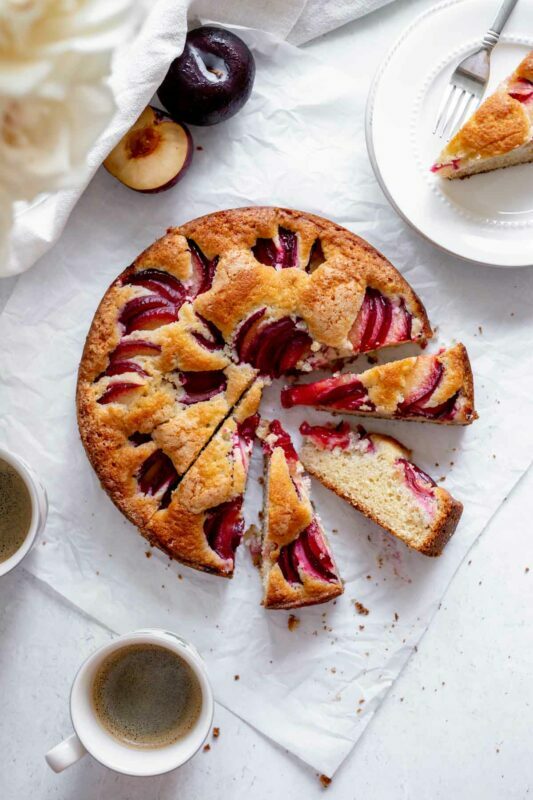 Plums straddle the line between summer and fall, and this is the perfect cake to welcome fall colors and flavors into our lives. First, we make a simple butter-based cake batter. You’ll need a hand or stand mixer to get the appropriate amount of air whipped into it. I tend to prefer hand-whisk-able batters over mixer ones, but sometimes, you gotta do what you gotta do for the appropriate cake reward. Then, spread that batter in a greased springform pan. You want a springform pan because it has high sides (best for those lovely browned edges you see above) and because it’s easy to remove the cake and cut it once it’s baked. You could probably also use a deep dish 9″ cake pan if you have one. You do you. Next, halve your plums, remove the pit, and arrange them cut side down over top of the batter. Golden plums are small, so I used about 10 for this cake. 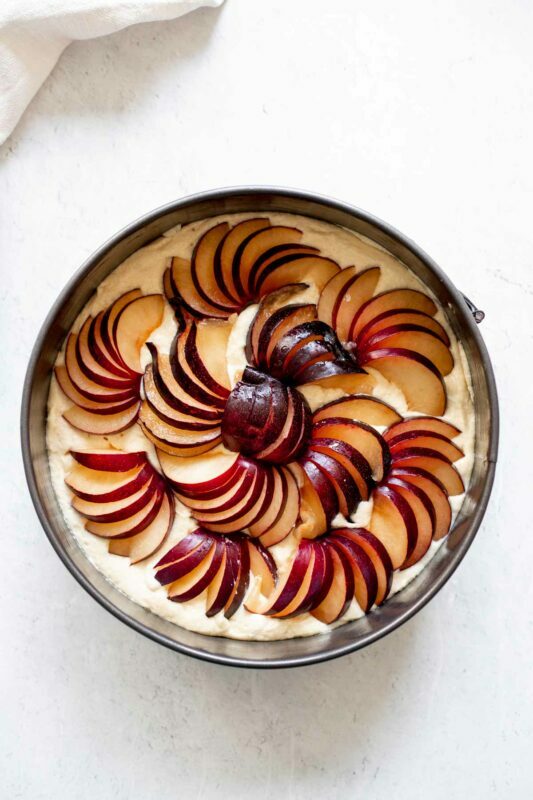 If you want to use regular plums, I’d suggest using 2 or 3 quartered plums – whatever will fit in the pan. Feel free to really crowd them into the batter. It’s all the better when they sink into the batter and bake down into jammy puddles in the oven. Yes, I said jammy puddles. We could stop there, but we’re not going to. Because the ultimate move here is to add the spiced almond crumble topping. 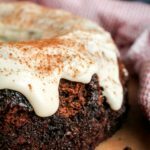 It’s equal parts sweet and crunchy, it smells of fall due to cinnamon and a hint of nutmeg, and it’s totally delicious. 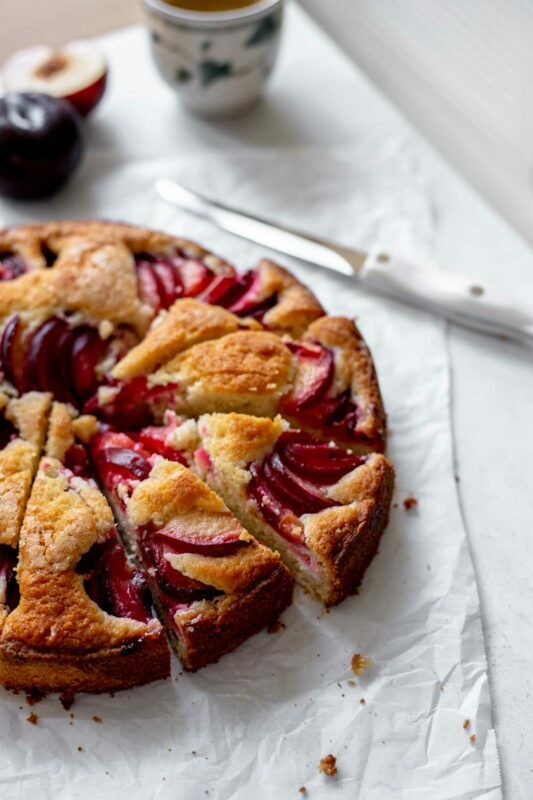 Combined with the buttery batter and jammy plums, it can’t be beat. I brought this cake into work on a Monday morning, and it was gone by 10 a.m. I think that means the Italians have it right: more people should have cake for breakfast. Please let it be you on this lovely weekend. 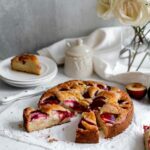 Golden plum coffee cake bakes up sweet and fragrant with jammy plums, a buttery cake and almond-crumb topping. Best served with a long, slow morning. Preheat oven to 350 degrees F. In a large bowl, with a hand mixer or stand mixer with the paddle attachment, beat butter and sugar together at high speed until light and fluffy, about 2 minutes. Add eggs one at a time, beating on medium speed after each, until fully incorporated. Add vanilla and Greek yogurt, and beat on low to medium speed until incorporated. Add flour, baking powder, baking soda, and salt, and beat on low speed until mixture is just combined. Do not overmix. Remove the mixer attachment and fold in any remaining flour pockets with a spatula if needed. Spread the batter into a greased 9-inch springform pan (or a high-sided 9" round cake pan, if you don't have a springform). 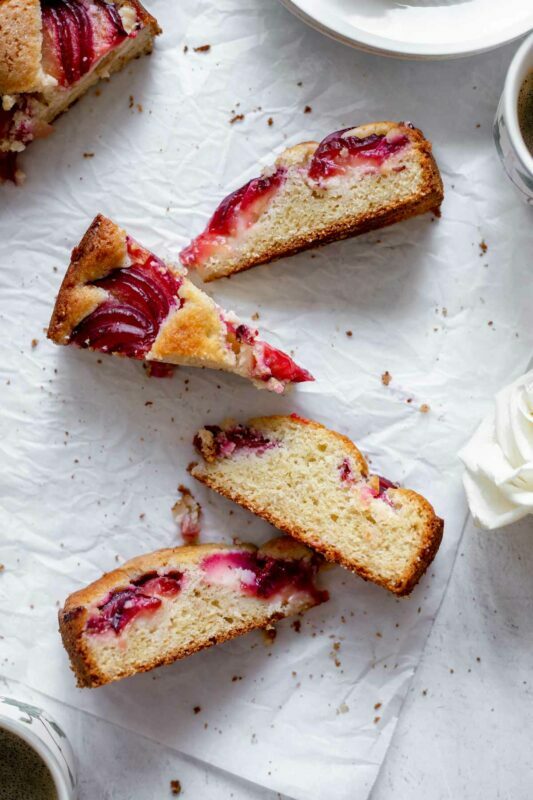 Arrange halved plums, cut side down, over top of the batter. 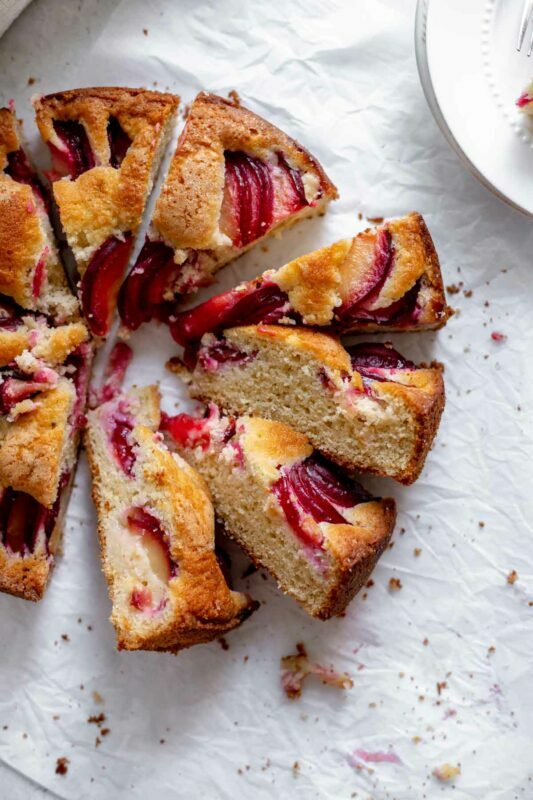 Feel free to really crowd them in there - the high the plum-to-cake ratio, the better. Top with crumb topping before baking (see below). Combine flour, brown sugar, cinnamon, and nutmeg in a medium bowl. Add cold butter and cut into the flour mixture, using a pastry blender, two forks, or your hands (my preferred method) until the mixture resembles wet sand with some pea-sized crumbs. Stir in the sliced almonds until combined. Sprinkle crumb mixture evenly over top of the plums and cake batter. Bake for 55-60 minutes, until risen, browned, and a tester inserted in the center of the cake comes out clean or with a few moist crumbs. Cool completely before serving at room temperature with yogurt and hot coffee! Adapted loosely from Marian Burros/Smitten Kitchen and Epicurious. Cake with keep, well-wrapped at room temperature, for up to 2 days. It will keep 3-4 days in the fridge. I think it's best served at room temperature! Cake for breakfast may just be my new life motto.